Nasal polyps are non-cancerous growths that can develop in the nasal linings of the sinus cavities and nasal passages and are often quite difficult to treat as sinus surgery is often only 50% successful. Our first herb is Bayberry which is said to have not only astringent and antibacterial properties but also steroidal actions. 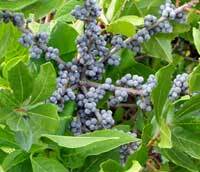 Steroidal action is achieved when bayberry is used in a type of snuff. Then there’s the infamous Goldenseal which is also purported to have astringent and antibacterial peripheries when used as a snuff. Goldenseal as a herb should however not be used whilst pregnant however Goldenseal in Homeopathic form is completely safe. The analgesic actions of Siberian Cocklebur together with its antibacterial properties help in the reduction of nasal polyp size allowing the underlying connective tissue to reattach themselves. These herbal items can be eaten in food (not too sure of their taste through) or taken in a herbal tablet form which for me sounds an awful lot simpler. Other natural treatments include the Homeopathic Remedy SinusWars13; an all-natural treatment designed to help target the reason behind nasal polyps such as irritation and inflammation of the nasal linings. Once this is treated, the nasal polyp is allowed to decrease in size allowing for re-connection of connective tissue matrix; a decrease in swelling and inflammation and also clearer nasal passages as nasal mucus is allowed to drain freely.